Tai Chi can play an important role in your overall health. Although it has not been shown that Tai Chi for osteoporosis can lead to stronger bones, it can still be part of an effective exercise program for people with osteoporosis or osteopenia. Tai Chi can improve your strength, balance and body awareness — all important ingredients to a fall reduction strategy. As a result it is one of the great balance exercises for seniors. To address these challenges, I have prepared a video demonstration of a basic foundation Tai Chi program comprised of 8 moves. I call the video: Tai Chi for Osteoporosis | 8 Steps to Bone Health. Take a look. Tai Chi is suitable for almost everyone. I have been practicing for many years and have enjoyed the experience. It involves slow, rhythmical and deliberate movements that exercise and stretch all bones, joints and muscles. All movements should come from the Tan T’ien — located 3 to 4 centimeters under the naval and two thirds of the way inwards towards your spine. I am a big advocate of Tai Chi. Where appropriate, I encourage clients to practice this art. I just came across an article published in the May 2016 edition of Osteoporosis International titled The Effects of Tai Chi Exercise on Bone Health: a meta-analysis and systematic review on Tai Chi. A meta-analysis is when researchers look at previous studies, in this case on Tai Chi performed by peri-menopausal and menopausal women. The researchers study the earlier studies and see what they have to say. The researchers concluded that individuals who practiced Tai Chi experienced an improvement in the bone health of the spine – specifically in terms of bone markers and bone mineral density. Can Tai Chi Improve Bone Health? The research study brought to mind a video we did back in 2010. I know that many of you have not seen this video. At the time the video was behind the pay wall in MelioGuide but now it is available for free on YouTube. It is set in beautiful Jamaica and is available for all you listeners to watch and to learn from. In the first three minutes of the video I mention the study that the short eight-form was based on and then demonstrate the eight-form from a front on view. If want to learn Tai Chi but think that it is too complex to learn and that there are too many steps, this program is a great start because there are only eight steps to learn. It’s a lot easier to practice Tai Chi from the back view, as though you were following along with somebody. The back view starts at about three minutes and then at the five minute mark I break down the steps and you can practice each step one at a time. I repeat them 10 times each. That allows you to gradually learn a short form of Tai Chi that is good for your balance and good for the health of your bones and your spine. Three more little things to say about Tai Chi practice. Keep a posture as one Tai Chi Master said, “As though you’ve swallowed a sword.” Maintain a tall posture for you to practice. Consider wearing footwear that is flat and not too grippy so that your feet can glide on the surface that you’re practicing on. Make sure you are rotating from position to position and you can easily pivot your feet. The rotation of the torques should not be happening around your knee joint. For more information, check out my Balance Exercises for Seniors guidelines. What a great video! I took your Osteoporosis Level 1 course Sept 2009 and found it very helpful. I just started working for the Integrated Regional Falls Program for North Simcoe Muskoka and I am involved in running screening programs for seniors at risk of falling. One of our interventions is providing links to resources in the community and one of them is Tai Chi. 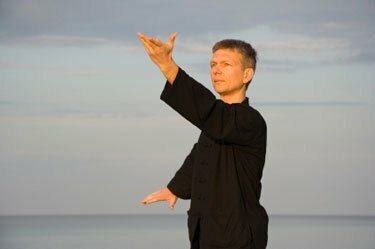 I’d like to use the link for this website to demonstrate what Tai Chi looks like if that meets with your approval. I have recently started Taoist Tai Chi and have just completed the introductory program. The moves are a little different than the ones in your video. Is the form of Tai Chi I am doing beneficiary to my bones as well? Hello Joan – Taoist Tai Chi is just slightly different than Yang style in the actual physical moves. Depending where you practice there is a bigger emphasis on the spiritual aspect of the art. As for the studies looking at the benefit of Tai Chi on balance, bone density, cardiovascular health etc. either style will provide the same benefits. The frequency, duration and years of practice larger determinants of the benefit you will gain than the style of Tai Chi. I hope this helps answer your question. All the best to you for a safe and Happy Holiday Season. I had accidentally deleted your tai chi video and was most upset once I realized what I had done. You demonstrate tai chi beautifully and I thank you for advising me where to find your videos to enable me to download the tai chi ones again.